One of the most important relationships when looking from career aspect is boss – employee relationship. This is been one of the delicate as well as a respectful relationship every employee has to maintain. Most of them when hearing the word ‘boss’ have a notion that when he/she orders ‘I will do it‘. But the real factor is until and unless you understand your boss completely, it is difficult to fulfill his/her wishes. There are many key points to maintain this relationship transparency, mutual respect, and sometimes even diplomacy too. However, to understand and maintain you need to know your manager completely. There are few most important things you should ask your boss and know yourself which will help you maintain healthy and a cordial relationship. Here are few questions you should ask your boss to understand him/her better, where as this will help you set your motive, and will put you together with your boss effectively. 1. Hello, how is the day going.? The very first thing to maintain any relationship is to greet each other everyday. You need not sound formal, but always make it a habit to greet your boss with this question. This need give you any straight answers but will help you some day to know any real issues going. By this question you are helping your boss to be open and also making him/her focus on you as an individual. 2. Anything specific for me today.? Some of the most common questions need to give you any answers but it will trigger your boss to be more close with you. You might have been given a goal or a week’s target priorly. But question like anything specific or something to convey will gain a importance in the team. Sometimes it will also gain you good replies and there are times where you might not get anything out of it. But for sure good impression is guaranteed in long run. 3. Am I doing the right thing.? Getting to know what you are up to is one good manner that can be followed with your boss. This question about your performance or whether you are doing right will help you some day to get a proper guidance from your boss. Never ignore these kind of questions to ask because it might help you correcting you when you are wrong, and also will gain a reputation about your updates with your boss. Communication is one strange part in office where no one could understand what others expect. This in case with bosses, few of them expect to always keep them updated where as few of them does not like always their mail box keeping beeped often. So, it is better to know boss pulse with communication. Keep your question in a light way. For example, you can ask specifically like should send you updates about this project weekly or is it only just updates or can I reach with emails on weekend or will it wait till Monday.? These polite questions will show your concern about your job. 5. Anything important with the organization.? Keeping yourself updated about the organization news is the way you take care of your job. This question is good to go because it shows you are proactive about the organization as well as it creates an image about your involvement in your job. It builds a rapport with your boss, so that he/she will be free to discuss about the real stuff going around. One tip along with this question is know your boss mood and then proceed. 6. Where it has to be improved.? There might be times where you commit mistake and your boos very well does not feel good about it. This has to be corrected. Never hesitate to put this question often to correct your mistake as well gain confidence from your boss that you would improve. Keep this question in a positive tone and always regular because one day even when the issue is severe, your boss might forgive for your positiveness to correct yourself. Getting new projects, updating previous projects are very common on day to day process. The very first thing which a boss would expect from any level of employee is to maintain the time limit. And sometimes few bosses would not set time limit but expect you to have your limitations and not to drag. So to know the seriousness of the project or to know the expectations of your boss, it is better to put a neat straight question and then proceed with your work. Team building is not only a responsibility of the boss but also it belongs to the team. And one most important thing every boss would expect is to maintain good relationship with every one inside the team, and also to care about the whole team’s progress towards the goal. Asking a question about the entire team’s well being is very important to keep your image high. Be casual and have a concerned tone to set your question in a right way. You should always remember to proceed knowing the real procedure of any kind of task. Ask questions about the progress, or kind of changes updates about your work at a right time. This will help you a lot personally as well make your boss feel that you are responsible and committed towards your work. This question is very common and can be addressed every week to your boss to know your status in your work as well set a right beginning for your upcoming week. Once when you have made it a habit to ask, you should always remember to miss the routine which can bring adverse effects. Follow a good routine every week about the performance with your boss which will benefit you in future. Keep it a habit to always help your boss with few things. This question does not need to be flattering but it will surely give you good understanding with your boss as well as make you stand as a good person over all. This question is not to build your image but to always keep you best at all paces. 12. Is there any bottlenecks for the upcoming week.? This question is good to go with your boss to keep yourself prepared for the upcoming week. Sometimes there might be some hindrance in your projects, or any kind of hold in your over all team’s work. Never expect always your manager to update. Try showing your concern and keep yourself updated with the work that needs to be done over all. 13. How tough it was to be where you are today.? Learning is not only from your work, it has be done in all modes possible in your work environment. Try getting some expert advise often to make your progress good in your career. Ask your boss when you get chance to know about his path to this level. This will surely give you a good knowledge as well as will help you to have a mentor for your career. For every thing you work for or do in your job will take you to a good level some day. A boss – employee relationship is important and has to be maintained by good understanding. Never hesitate to ask questions and show your presence often. 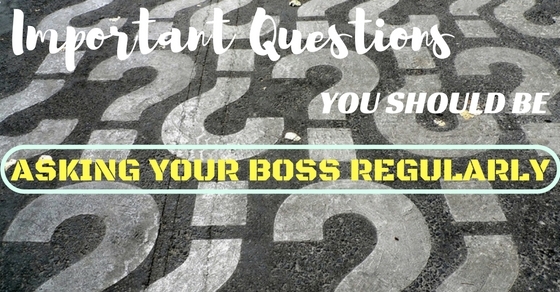 Hope this post helps you to know more about the questions to be asked frequently to your boss. Previous articleShould Employers Monitor their Employees Social Media?